This is a highly worthwhile investment and an opportunity for our talented personnel to enhance their education and enhance our organization's reputation for providing optimal patient care. HMP, a leader in healthcare content and continuing education events, announced today that the Rehabilitation Hospital of Northern Arizona (RHNA) has chosen HMP's Wound Certification Prep Course (WCPC) to train its health care personnel. 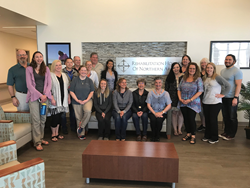 The private course was held June 9-10, and was offered to approximately 25 health care providers, who spent two days reviewing wound healing strategies and topical therapeutic interventions. The program prepares participants to sit for either the Certified Wound Care Association (CWCA) or Certified Wound Specialist (CWS) board examinations. "We are pleased to be working with RHNA to further advance their team's knowledge of wound management through our preparation course," said Nicole Molinari, associate manager of national accounts, NACCME, the medical education subsidiary of HMP. "RHNA's commitment to ensuring their team is wound certified will not only benefit their providers by equipping them with practical clinical tools to improve care quality, but will also benefit the patients for whom they provide care." As the only review course recommended by the American Board of Wound Management Foundation, WCPC is the industry-leading preparation course providing a comprehensive review of wound management for those interested in preparing for wound certification board exams, recertifying, or gaining a more advanced understanding of wound care. "This is a highly worthwhile investment and an opportunity for our talented personnel to enhance their education and enhance our organization's reputation for providing optimal patient care," said Dr. Richard Hold, medical director, RHNA. To learn more about the Wound Certification Prep Course, please visit woundprepcourse.com. HMP is the force behind Healthcare Made Practical - and is a multichannel leader in healthcare events and education, with a mission to improve patient care. The company produces accredited medical education events and clinically relevant, evidence-based content for the global healthcare community across a range of therapeutic areas. Its brands include Consultant360, the year-round, award-winning platform relied upon by primary care providers and other specialists; Psych Congress, the largest independent mental health meeting in the U.S.; EMS World Expo, North America's largest EMT and paramedic event; and the Symposium on Advanced Wound Care (SAWC), the largest wound care meeting in the world. For more information, visit hmpglobal.com.